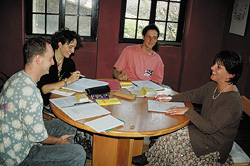 Cuenca, Ecuador is the most amazing place to study Spanish! It was such a welcoming city, I found I could learn, study, make friends, and practice my Spanish, all with ease. It’s a unique part of Ecuador with history so special that it has been chosen as a Unesco World Heritage Trust Site! There are so many things to see and do in Cuenca, including admiring the amazing views of the Andean Mountains which surround the city! Cuenca is also a bustling university city, so I was always sure to find both international and local students amongst its streets mingling among the locals. The city had an awesome atmosphere – a real mix of old and traditional and youthful and modern everywhere I went.